Many of you know the all-too-famous statue of Lenin that used to adorn Republic Square (previously Lenin Square) in Yerevan. It stood ad locutio in the southwestern corner of the square from 1940 to 1991, when it was ceremoniously removed from its pedestal and deposited, along with its era, in the History Museum of Armenia. Legend has it that the soldiers who pulled Lenin off of his pedestal drove him around the square three times, as if transporting a coffin in a funeral procession. (I am only aware of the tradition of wedding processions driving through the square, but what stories are emphasizing, I believe, was the general presence of mock ritual. Robert Krikorian discusses the event here.) 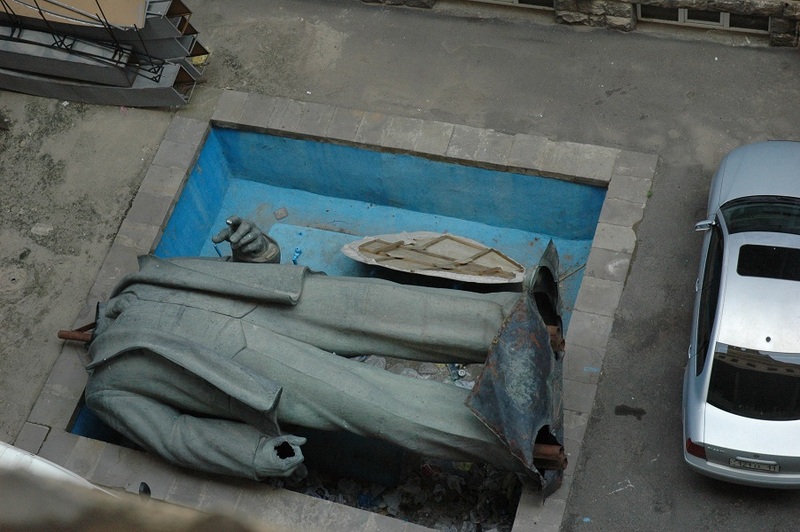 Rusting and short of a head, Vladimir Ilyich now lies quite unceremoniously in the courtyard of the museum, and though this area is not open to the public, a friendly word with the museum staff or the guards goes a long way. His old pedestal, meanwhile, has been replaced by a patch of grass and a flowerbed after standing empty for five years, from 1991 to 1996. Once in a while, the government calls for or receives proposals to fill the space once occupied by the father of the revolution. Bringing in suggestions for statues of Tigran the Great and Mount Ararat as well as of full-blown churches, these attempts have so far resulted in foreseeable failure. Whether we have a unifying image or symbol appropriate enough for such a central space in Yerevan is one important question to consider. Both the popular base and audience for any such image or symbol are two others, as the very makeup of Armenia and Armenianness is proving more dynamic than we could expect of the Soviet or immediate post-Soviet eras. Two summers ago, when digging through crafts and flea markets in the name of research, I found an album of detailed photos and sketches of the Lenin statue, which I would like to share today. It was commissioned by the Armenian Gosstroy (Committee for Construction and Architecture) and published in 1964 as the third edition of a series titled Monuments of Armenian Architecture. All of the captions and explanatory essays that accompany the illustrations appear in Armenian, Russian, and English, which begs the question of the intended audience, both identity-wise and temporally. The aim of the series seems to have reached beyond the conventional dry recordings or the all-too-common glorification. The committee seems to have aimed for preservation and education for a wide audience at a time when, as I’ve discussed, monumentality and architecture were major questions of the day. The singular value of this particular album is the richness of detail it shows. Though I’ve studied the statue conceptually before, I had no idea that its various components were so ornate or that the space inside its pedestal was so well-developed. Moreover, it’s time we had alternatives to this widely circulated shot. See for yourself! Below is a selection of the images. Cheers to the Vernisage vendor who let me shamelessly haggle for the collection. The floor inside the pedestal. Who would’ve known?